This coupling has one locking element each side as the drawing on the other side of the page shows. As you tighten locking screws and use the wedge friction, the clearance between shaft and sleeve is decreased. Finally it connects both shafts firmly when the clearance is gone. It gives you a high rotation accuracy of the shafts, because you can get rid of the clearance between shaft and sleeve by tightening locking screws. Because the force is transmitted by contact pressure and frictional surfaces, proper tightening of the locking screws is very important. Connect Servo Coupling to motor shaft, and tighten locking screws lightly. 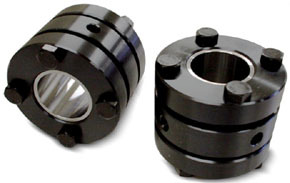 Connect this assembly, Motor and Servo Coupling, to the shaft end of the ball screw. tighten the other side of locking screws same as the installation 2. Recheck tightening torque by applying it to all screws all the way around. When none of screws turn any more, the installation is completed.